Check out our Weekly Dashboard Report to have clear understanding of what you can expect. ... or scroll down to see our unique features and how can they help you to create competitive advantages! Be the first to know about every competitor who pops up on the market. 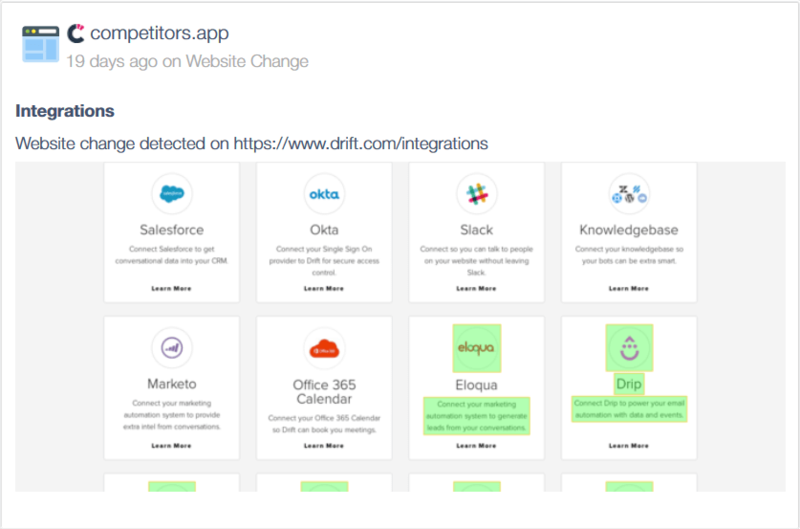 Competitors App will automatically detect new competitors and inform you through email - allowing you to take different actions based on the insights we gather. Quickly discover and monitor all of your competitors’ PPC campaigns and gather all the insights you need to create better Google Ad campaigns. Constantly navigating through your competitors’ social media accounts or receiving annoying notifications is in the past. Through just one dashboard, keep an eye on your competitors’ social media pages, gather relevant insights and information, and be ready to create killer social media campaigns! Having better keyword ranking than your competitors’ is crucial. What if we say to you, that you can monitor their keyword rankings all the time? 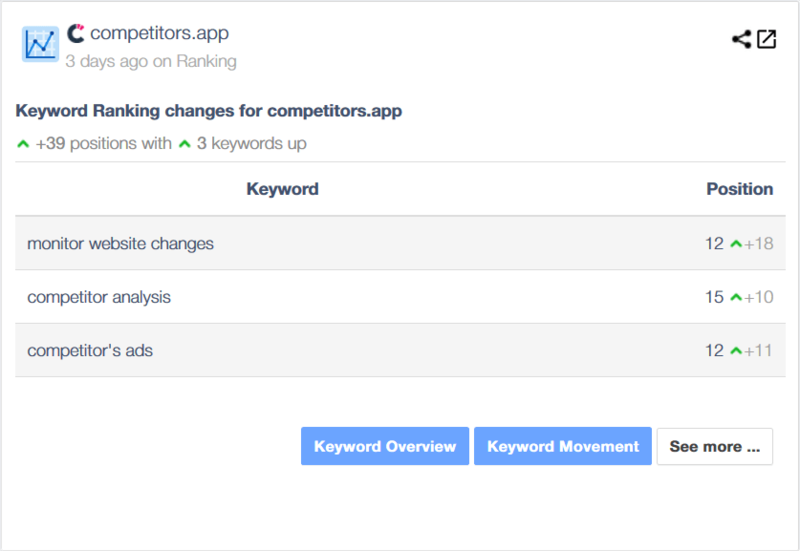 Understanding competitors’ keyword activities will help you to focus your SEO and backlink building efforts where you need the most. Don’t bother yourself with day-to-day scrolling through your competitors’ websites anymore! Whenever your competitor make some big website change (changing CTA button for example), we will automatically notify you through email! Easily keep-an-eye on your competitors’ SEO efforts. 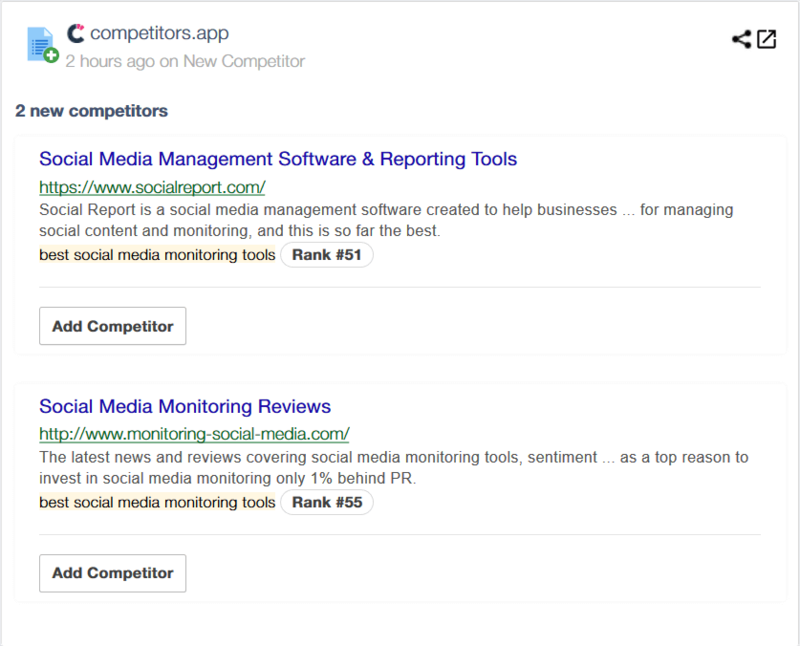 Whenever your competitors make some change that will affect their SEO (like changing blog post title or focusing another keyword), you will be the first to know about! What if your competitor created a “[your company] vs [your competitor] - detailed comparison” page a while back on their website, but you didn’t notice it? This is really important to know as soon as they created it. 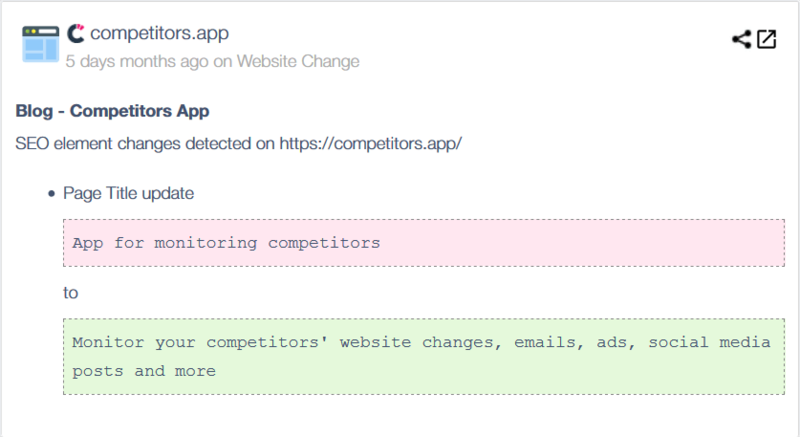 We will automatically detect new competitors’ pages for you - whether they are dedicated features pages or FAQ. Be the first to know everything! You don’t need to be subscribed to your competitors’ newsletters anymore. 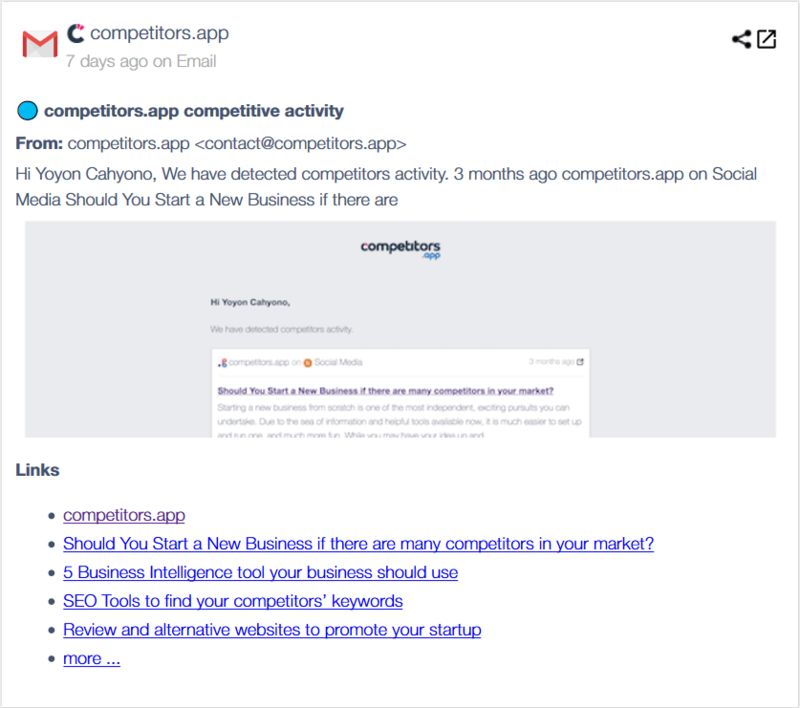 Competitors App monitor your competitors’ newsletters for you - every day in the week. Be the first to know about your competitor’s new actions, bonuses and updates - even before their subscribers and customers. Easily discover your competitors’ content marketing strategies and be ready to craft better content or create competitive advantages based on the insights! You were spending hours per week constantly navigating through your competitors’ websites, social media feeds and gathering poor insights about their campaigns. Don’t do it anymore! All these features will just take a few minutes a week to process! We will notify you through your email only when some big change happens. Check out our Weekly Dashboard Report to have a clear understanding of what you can expect from Competitors App.